As read in Decembers newspaper i felt of writing this little article impacting lakhs of local train travellers about Railway authorities catching up with Android Mobile apps in faster phase. 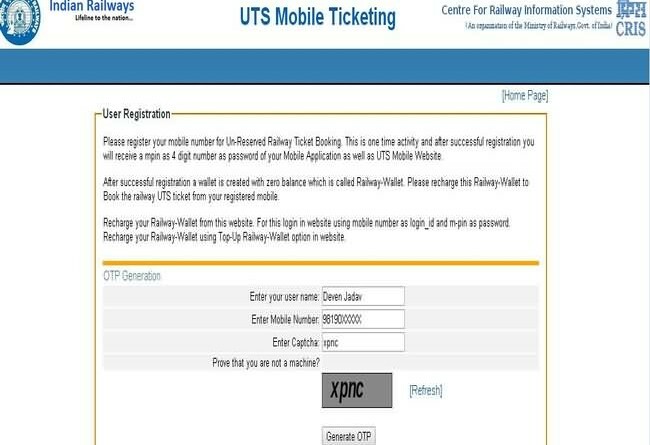 They have already decided on getting a Android app for local train mobile ticketing system. A robust and secure app with powerful back end support system that will work handy and people commuting from local trains will be able to press few buttons to get an electronic version of journey ticket message on your cell phones which will be secured and non transferable or copied. 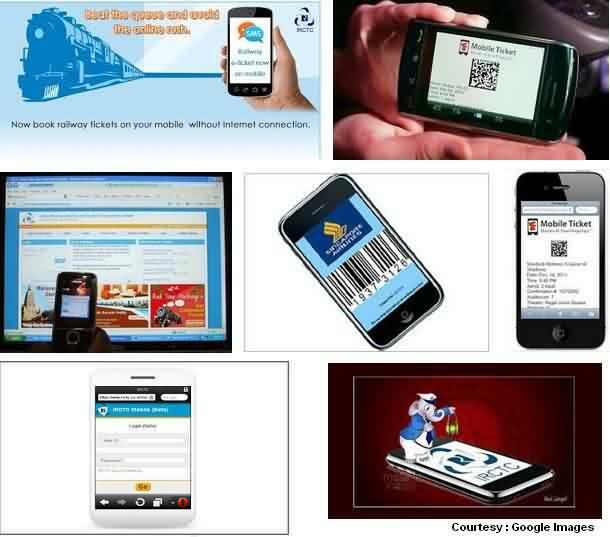 According to their survey and information, about 40 percent people who travels through local trains in Mumbai uses Smartphones ‘in particular Android phones’, and a good advantage can be taken being serving digital tickets as and when passengers demands after reaching any railway stations within Western, Central and Harbour route, via their own smartphones. Special devices will be given to TC (Ticket Checkers) to check those served mobile tickets in a distinct secure way so that no misuse or cheat happens if done with any loopholes if any found. The whole system on how the tickets will be served, what will be the app called, How secure and robust whole ticket system will be and how soon will this mobile tickets be available to end users is still not decided. Yet the idea and initial step is great and hope to get it soon be possible. Many other commuters who are tech savy and have Non-android phones like iPhones, iPad etc may ask if ticket system will be available for them ? We really don’t know what IRCTC is planning for same, But who knows because if it can be done for Android, It is surely possible for Other smartphones like iPhones. Lets just wait and watch. Note: We will update this article as soon as ticket system are in place or the under process work details are revealed by Mumbai railway authorities. Limitation in the previous app of smart ticket less commuter booking tickets (Between Churchgate and Dahanu) only when a TC (Ticket Checker) seen is well handled now. Indian Space Research Agency (ISRA) who used G-SAT 10 which is a powerful GPS satellite communicator has put forward the helping hand to Mumbai Railway by adding the exact location tracking feature of the ticket booking persons mobile. It has a strong firewall and accurate location finder which has helped railway app boost with a strong feature and get rid of the cheaters. Update 1 : You don’t need to use the ATVM after you book the tickets from the app. A soft copy PDF file will be received on your mobile which can be shown to the TC when demanded. Update 2 : You CANNOT book your journey tickets with 30 meters distance inside station premise. Secondly you CAN only book the tickets with 2 kilometre range from Railway station. To be short and precise about the ticket booking range, it between 30 meters beyond and within 2 kilometres range limits of Railway stations. The above two strong and much needed moves fill that loopholes and boost the easiness of operating the app as many a times locating a ATVM was difficult and sometimes it was not operational. 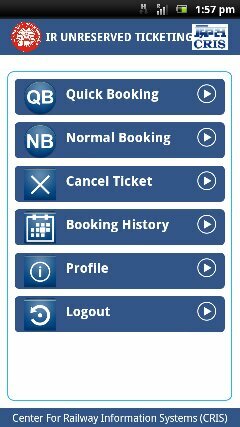 Now Do You Have Any Reasons For NOT USING the Free Mobile APP for booking tickets ? 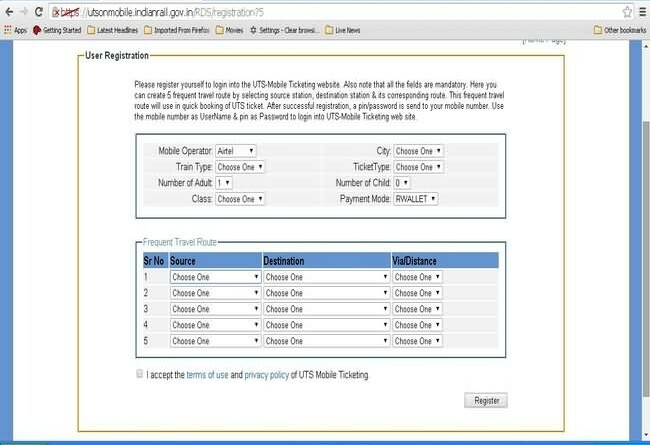 Below are step by step Pictures for mobile registration [ CLICK IMAGES FOR SLIDESHOW ]. 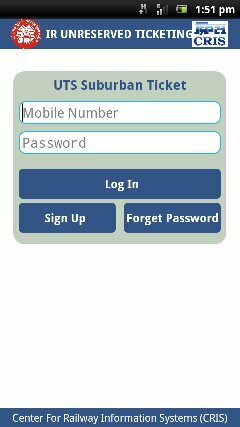 Screen 1 : Signup via mobile : Enter your mobile number, name and city (As of now MUMBAI and CHENNAI). 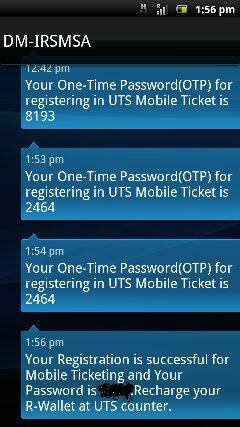 Now you will receive a OTP (One Time Password) to be entered for entire registration process to go ahead. 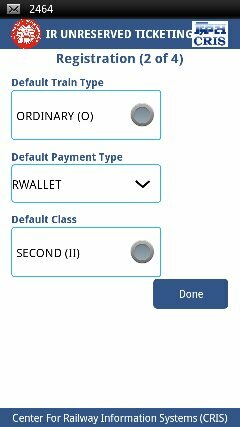 Next Screen (2 of 4) : Select train type (Ordinary), Default Payment (RWallet) and Default Class of travel (First or Second Class). Basically keep all defaults here. 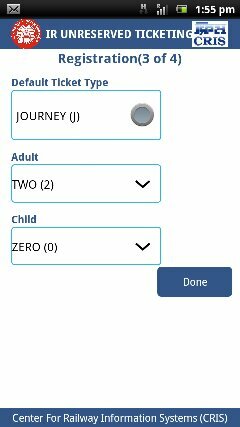 Next Screen (3 of 4) : Select Ticket types (‘Journey’ which is one way & ‘Return’ which is to and back), Select total adults (Max 4 to 5) and Total Children. 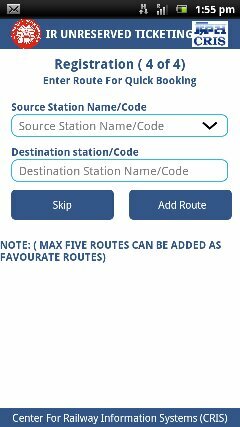 Next Screen (4 of 4) : Currently Only 2 stations in SOURCE are shows (Dadar Central and Dadar Western), So you can SKIP this step as of now. 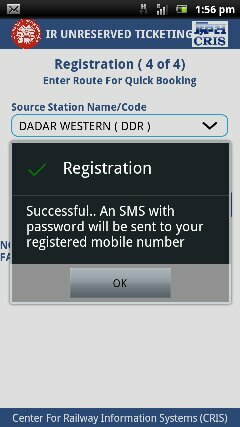 Next Screen : Registration Done and you will receive a password SMS on your registered mobile number. App Password : At this stage you will receive PASSWORD for your App. Upon successful Registration, Your unique R-Wallet account will be opened which will have Zero balance. R-Wallet will be used for Recharge, Refund and Cancellation related transactions. One needs to close the R-Wallet to get the refund amount back, Which will only be done at selected UTS Counters. Use Login Username (i.e Mobile Number) and Password (That will be send onmobile) upon successful registration to get starting with mobile booking. Recharge your R-wallet account. Minimum recharge amount to use mobile ticketing is Rs.100 and Maximum is Rs.5000 (All multiples of Rs.100 only). Online recharge option will soon be started at the link specified in registration steps. 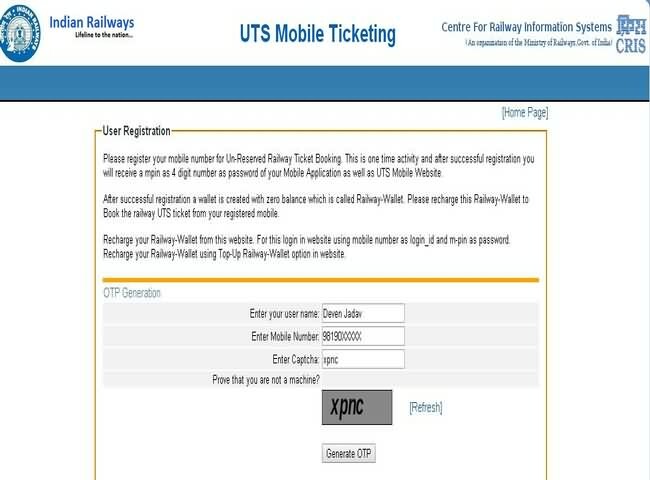 On successful booking via UTS R-Wallet through mobile, You will receive a confirmation message along with Booking details and Unique Booking ID. Now Go to ATVM machine of boarding station, Select the Mobile Booking option, Enter the Booking details you received on SMS and get the tickets printed. 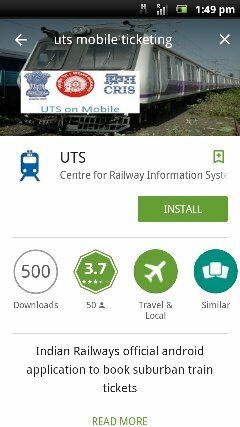 For Android and Windows Phone, App Exact name is “UTS” (Centre For Railway Information System). 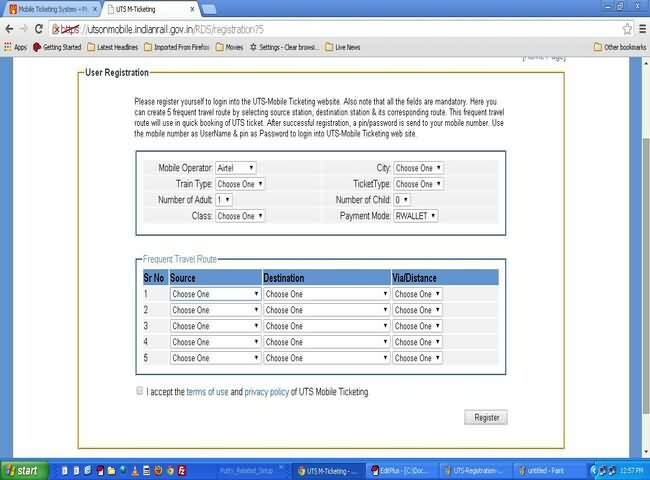 Thats is Indian Railway Mobile Ticketing UTS (Unreserved Ticketing System). 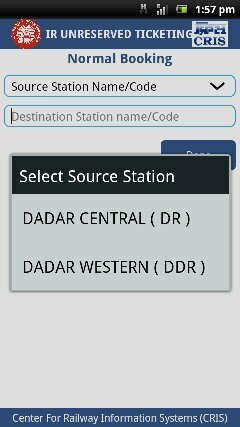 Initially on Dadar station was seen in station list, Now more stations have been added with compatible ATVM machines. They are CST ( CSTM), Dadar Central (DR), Kurla Junction (CLA), Thane (TNA), Kalyan Junction (KYN), Churchgate (CCG), Dadar Western (DDR), Andheri (ADH), Borivali (BVI), Mumbai Central (BCL), Vashi (VSH), Dombivli (DI), Ghatkopar (GC), Mulund (MLND) and Masjid (MSD). At one point of time android app gets stucks (Back button not working) and you have to select Dadar option then get back. For Non-Android (Featured Phones) Rs. 1 extra charge will be applied as people will use SMS text messaging system. Only current day booking possible, No advance booking or next day bookings. Total 4 tickets can be booked for second class and 1 Only for first class local train travel. For any reasons if ticket does not get printed, Refund and cancellation is possible. If ticket already printed and needs to be cancelled, Only UTS counters to be used. Refund amount will be added to R-Wallet. Seasonal Pass tickets also possible.